the pinpoint of light that shows that RoverвЂ™s landing spot. Requires 4 вЂњAAвЂќ alkaline batteries (not included). Requires 2 вЂњAAAвЂќ alkaline batteries (not included). PLEASE NOTE: The unit will not activate without the remote control. Note: Product is only intended to mount on a vertical wall. switched to the ON position. 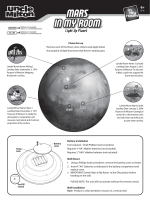 NOTE: For best Mars illumination, use in a darkened room. remote. Press ON/OFF button again to turn off. there is no manual interaction. вЂў Non-rechargeable batteries are not to be recharged. вЂў Rechargeable batteries are to be removed from the toy before being charged. вЂў Rechargeable batteries are only to be charged under adult supervision. вЂў Different types of batteries or new and used batteries are not to be mixed. вЂў Batteries are to be inserted with the correct polarity. вЂў Exhausted batteries are to be removed from the toy. вЂў The supply terminals are not to be short-circuited. вЂў Do not mix old and new batteries. вЂў Do not mix alkaline, standard (carbon-zinc) or rechargeable (nickel-cadmium) batteries. вЂў Do not dispose of batteries in fire. Battery may explode or leak. trademarks of Uncle Milton Industries, Inc.